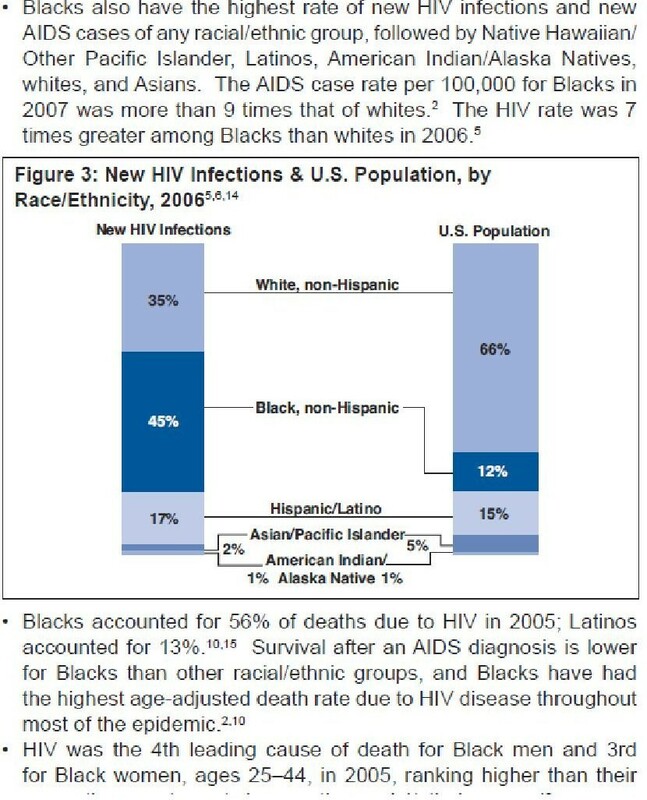 In the US, African Americans constitute 12% of the population, yet almost half of the total number of AIDS cases in the country occurs among them. This disaster is only now being generally recognized, with the leadership of the Federal AIDS response finally turning their attention to this tragedy, at least publicly. This is a tragedy that has been developing in full view for more than twenty years. One only has to look at statistics provided by the Centers for Disease Control (CDC) since the epidemic started to know, as early as 1987 that without intervention a preventable disease was inexorably moving into African American communities. Firstly, take a look at the situation in 2006 (data from the Kaiser family Foundation). Now take a look at this picture that clearly tells a horrible story that words cannot match. In the light of this devastating evidence how is one to understand the comments of Dr Fauci, who can be regarded as the head of the Federal scientific and medical response to AIDS? Look at the above picture again. Cases in African Americans started to exceed those in white Americans in 1994, but the trends were quite evident long before this. We knew in 1988-1989 what was coming. So, one must wonder why it took all of twenty years to announce only in 2009, that these statistics are shocking. A preventable tragedy was taking shape in full view of the Federal AIDS leadership, who rather than fund a vigorous prevention education campaign directed towards those most in danger, instead chose to support a wasteful, vacuous untargeted prevention education program in the form of “America Responds to AIDS”. It is not only the federal AIDS leadership that failed to respond to warning signals flashing brightly right in front of them. In the early days of the epidemic there was a vigorous and exemplary community activist response. This was a terrific example of people dealing with a deadly disease taking action on their own behalf, fighting for the best medical and scientific response and against the all too frequent shameful stigmatization of HIV infected individuals. The flowering of AIDS activism in the late 1980s and early 1990s achieved a great deal. All people dealing with serious illness have benefitted from the precedent that was set. Yet, in recognizing this achievement, we must also wonder why many of these experienced advocates, who no doubt were aware of the demographic trends shown above, seemed generally less willing to at least try to avert the disaster threatening their fellow citizens? Of course some tried, and maybe were overwhelmed by massive indifference. Whatever the reasons, the advocacy of US activists abroad, particularly in Southern Africa, proved to be more effective than anything they were able to achieve in their own country for their fellow African American citizens. There are also other groups where AIDS has been, and continues to be a growing problem, but have been relatively neglected. Not for profit organizations, that raise funds to help and advocate for people with AIDS were also aware of what was developing, but if there were any efforts devoted to preventing a calamity visibly descending on the largest community at greatest risk, these clearly were of little benefit. What is almost, but not quite, as shocking as the neglect of a disaster developing in front of our eyes, is the complete absence of any sense of contrition, let alone a simple acknowledgment of failure, on the part of those who might have helped to prevent it. If justice includes the notion of equity then prevention resources should be distributed in proportion to the needs of different communities. This clearly has not happened and it might be helpful to give some thought as to why this has been the case. We need to know and admit what it is that we did unsuccessfully, or failed to do, to stop a preventable disaster, so that we can get it right in the future. Instead we have a wringing of hands by those who could have done something, but did nothing, to stop this. A similar article was posted on a health related web site in December of last year. There was no response to the issue I raised. This post can be seen here. 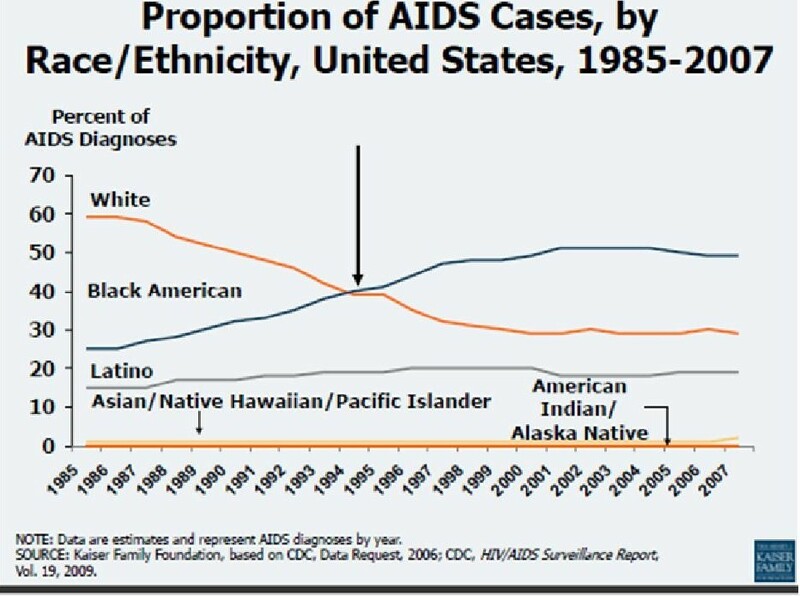 Take yet another look at the picture showing the changes in the proportion of AIDS cases according to racial/ethnic group over the past 20 years. It tells the whole story; no comment is really needed.